UICC Fellows come from around the globe and work in all areas of cancer control. Over 4,000 fellowships have been awarded and UICC conducts regular surveys to analyse their impact. Awarded UICC fellows mention that their cancer knowledge has increased and their professional networks have expanded as a result of their UICC fellowship, and that their new skills are much valued by their Home Institutions, Click here for testimonials from awarded fellows. Our most recent survey also showed that 60% of fellows have either published or are in the process of publishing with their hosts. Please see below for the names of the 73 fellows awarded through the UICC-Technical Fellowships, BAF, YY study Grant and African Cancer Fellowship programmes in 2018, along with their fellowship titles and host organisations. See also below for the list of UICC Fellowship reviewers who kindly evaluated for us in 2018. Through its fellowship programme, UICC aims to support health workers and cancer professionals focussing on cancer control, including cancer prevention, early detection, epidemiology, implementation and translational research, cancer treatment (surgery, radio- and chemotherapy), multidisciplinary patient care, rehabilitation, survivorship and palliative care. In 2019 there are 3 fellowship programmes available, the Technical Fellowships (UICC-TF) which provides the learning of new knowledge and skills in cancer control through a one month visit to an institution abroad, the YY study grants allow established cancer professionals to visit an institution abroad for 3 months to foster collaboration and knowledge sharing, and Bourses pour l’Afrique Francophone for cancer professionals in Francophone Africa. En français: Les Bourses pour l’Afrique Francophone sont des bourses d’un mois spécifiquement destinées aux personnels de santé et autres professionnels travaillant dans le domaine du cancer et basés en Afrique francophone. Bourses d’un mois spécifiquement destinées aux personnels de santé et autres professionnels travaillant dans le domaine du cancer et basés en Afrique francophone. Le montant de la bourse est entre 2,000 et 3,400 dollars US, justifié selon le projet et le pays choisi. La clôture du premier appel à candidatures était fixée au 19 avril 2018. Apporter un soutien aux candidats basés en Afrique francophone à réaliser une visite d’un mois dans un autre pays francophone de la même région ou plus loin, selon l'emplacement le plus approprié pour le besoin, en vue d’acquérir de nouvelles connaissances, renforcer leurs compétences et former des collaborations en vue de les appliquer de façon effective à leur retour dans leur institution d’origine. Ces bourses visent à contribuer à l’émergence de futurs leaders dans la région, à diffuser les connaissances et compétences acquises dans l’institution d’origine et à favoriser la mise en place de nouveaux réseaux de collaboration. Fellowships of one month aimed specifically at health workers and professionals working in cancer who are based in Francophone Africa. The award amount is between 2,000 and 3,400 USD, appropriately justified according to the project and the selected country. The deadline for the first call is 19 April 2018. For applicants based in Francophone Africa to go to another French-speaking country in the same region or further afield, depending on the most appropriate location of the training need, for one month to exchange knowledge, enhance skills and form collaborations that can be effectively be put to use in the home organization upon return. These fellowships should contribute to the establishment of future cancer leaders in the region, and have a multiplier effect such that the skills learned are disseminated throughout the home institution and new networks are built. A dedicated workshop at the 2018 World Cancer Congress for fellows to share their fellowship and knowledge sharing experiences with other awardees. An online common interest network where awardees can exchange acquired knowledge and share lessons learnt. 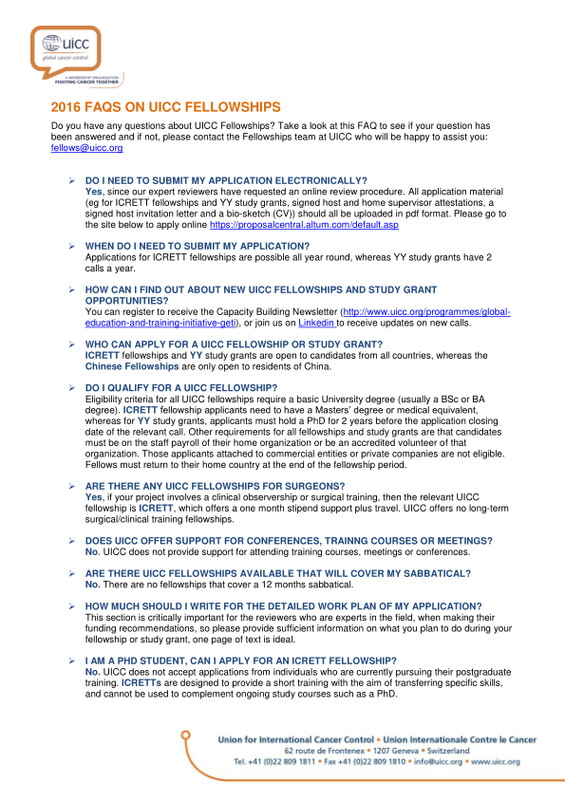 UICC Fellowship reviewers are volunteers who are internationally-recognised experts in their field of expertise, they help to assess the relative merits of the many worthy applications for UICC Fellowships. Over 500 international experts contribute more than 3000 hours of voluntary time to review applications each year. UICC expresses its grateful appreciation to all of the reviewers who reviewed for us in 2018. Their names are listed here. Without the expertise and know-how of these voluntary expert reviewers, UICC would not be able to have such a wide-reaching effect on global cancer control. The collaboration of these volunteer expert reviewers is what enables our fellowships to function. This international review panel works in conjunction with UICC Fellowships Project Chairs profiled below. Nicol W. Keith is Professor of Molecular Oncology at the Institute of Cancer Sciences, Glasgow University in the UK. Dr Keith’s research is focused on the development of novel therapeutics that target cellular senescence and telomerase, he is also a member of several national and international scientific committees. Dr Keith chairs both the UICC Technology Transfer Fellowships (previously called ICRETTs) and the Yamagiwa-Yoshida Memorial International study grants committees. Dr Rob Jones is a senior lecturer in medical oncology at the University of Glasgow. His interests include the design and execution of clinical trials, particularly those using new anti-cancer drugs. He also has an interest in the clinical aspects of new drug discovery and collaborates with basic science colleagues at the Beatson Institute for Cancer Research. His clinical practice is based at the Beatson West of Scotland Cancer Centre and focuses on the management of cancers of the prostate, bladder and kidney. Dr Jones serves as Co-Chair of the UICC Technical fellowships (previously called ICRETTs). Professor Benider is the Chair of the Bourses pour l’Afrique francophone grant committee, UICC's fellowship dedicated to cancer professionals based in the Francophone African region. Professor Vanderpuye is the Chair of the African Cancer Fellowship grant committee.